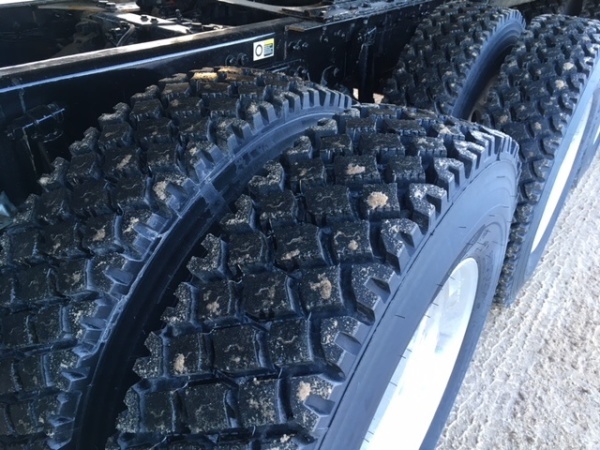 Michelin is launching what it calls “its most aggressive drive-axle tire” in the Michelin X Works Grip D tire, made specifically for energy-sector and logging fleets operating in extreme conditions . In fact, truck operators and dealers in the Grande Prairie, Alta. area were at the heart of the development process, the company says. They provided first-hand feedback during the next two years, including input on tandem and tri-drive tire prints. Traction is created by staggered shoulder blocks that provide lateral grip to handle slippery conditions and sawtooth lugs with more than 800 serrated edges that maximize grip on ice and snow-packed surfaces. Through the combination of an extra-wide tread and an optimized rubber-to-void ratio, traction is maximized without sacrificing mileage. The Michelin X Works Grip D tire will be available in 11R24.5 size and load range H.